I have so much catching up to do, here on my blog and even on instagram. Last week my website was getting attacked so it was put down for a few days until we could deal with it, and now that it is back up I was looking and realized I never shared this calendar. Whenever people ask “So, what have you been up to lately?” I go completely blank. I’ll say nothing, and then conversation turns awkward. I’d honestly believe nothing happened, if it weren’t for me keeping these boards. I look back and think “Holy cow, I was so busy!” The fall board is already down to the bottom again already. 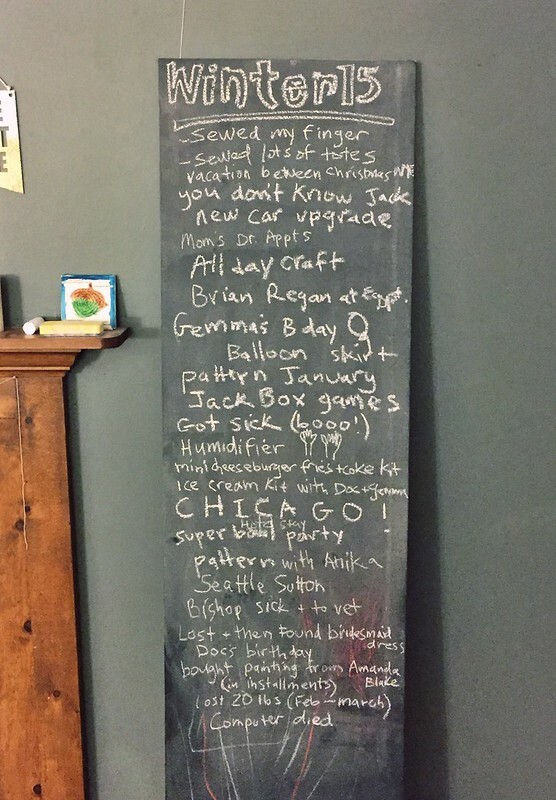 Previous Chalkboard Calendar posts right here! 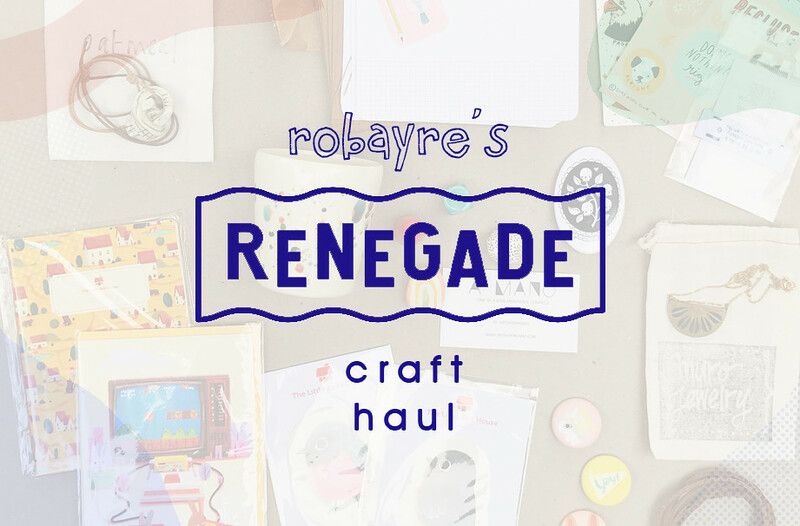 I decided this year I wasn’t going to post a Renegade haul, and just not worry about it. Some of the vendors didn’t give me bags or business cards and so I was going to skip the whole thing. Then I started feeling kind of bad for breaking the yearly tradition that’s been going on for probably over a decade. I gathered up the treasures, many that had already been in heavy use, and took this quick overhead shot. My sister’s items aren’t included, and neither is the Justice of the Pies pie we bought (but you can visit the last couple years’ posts to see what it looks like, as we bought the same one). As I said before, I’m not sure the artists of a couple of the items. 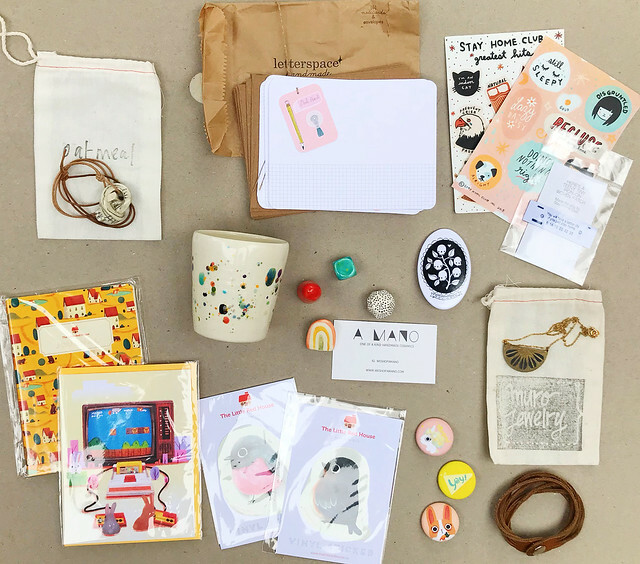 Top left and clockwise, spiraling in: Oatmeal ceramic knot necklace, Letterspace stationery cards, Stay Home Club stickers and iron on patch, Muro Jewelry necklace, leather bracelet from ?, buttons (I think are from the same artist as the..) stickers, card and notebook by The Little Red House, A Mano ceramic speckled cup, spirit stones and rainbow brooch, and a skull button from Migration Goods. 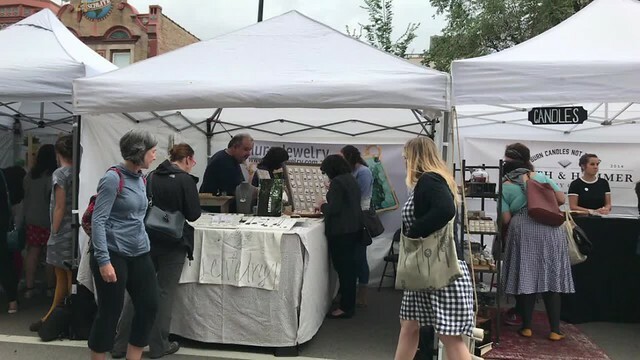 Rosa was back again and so of course I caught another video of people shopping in front of her booth. And we (L-R, my sister Chris, Rosa and Me) took another picture. I wear this necklace allllll the time. I love it so much. 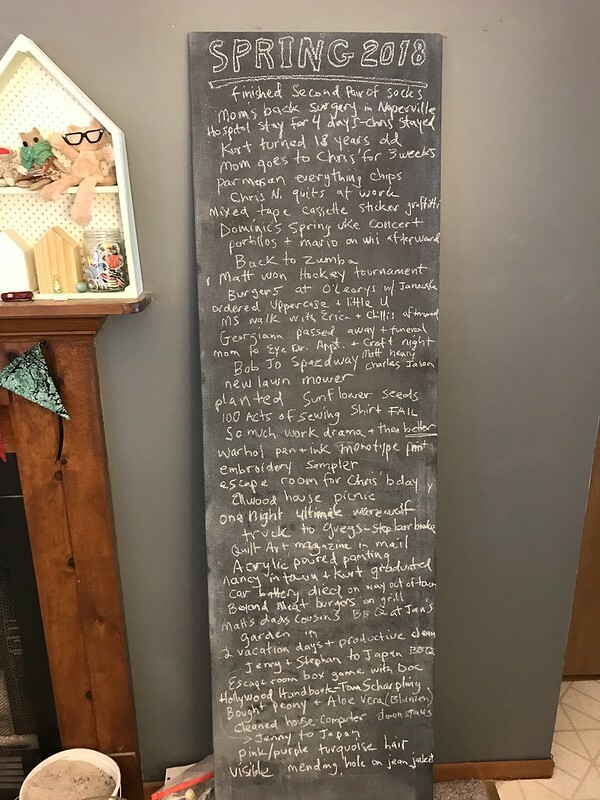 It is not out of the ordinary that I don’t get around to sharing my previous season’s chalkboard until fairly late, BUT usually I have taken the picture and already moved on to the next board by the time I post it. This time around, I still haven’t even erased the spring board, and I feel super guilty about it. I’m gonna have to use my phone (going through pictures I’ve taken) to try and remember all the things that have happened so far this summer. One thing that I will have to share on the Summer chalkboard is that I just had my 5 year Fitbit Anniversary. On the evening of my anniversary I had 19, 976, 371 steps. That averages to 10,945 steps per day, and almost 4 million steps a year. 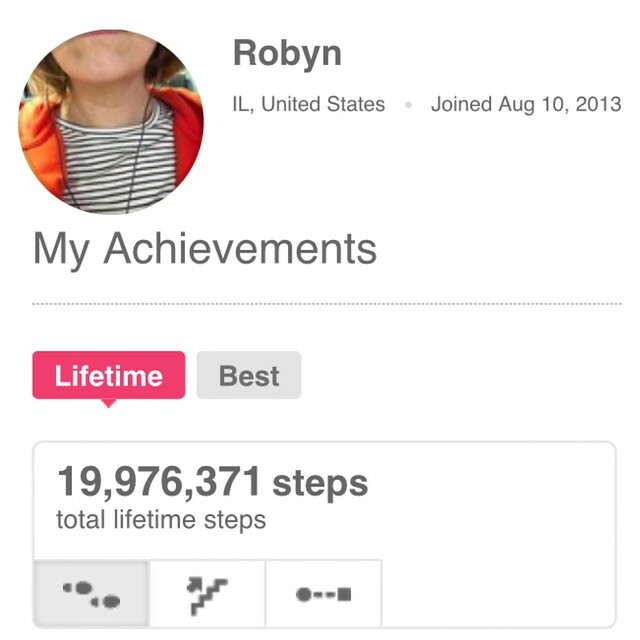 I posted to my blog on previous anniversaries, like here, and I have been averaging almost 4 million steps per year. I am so glad I found fitbit and I love my One. 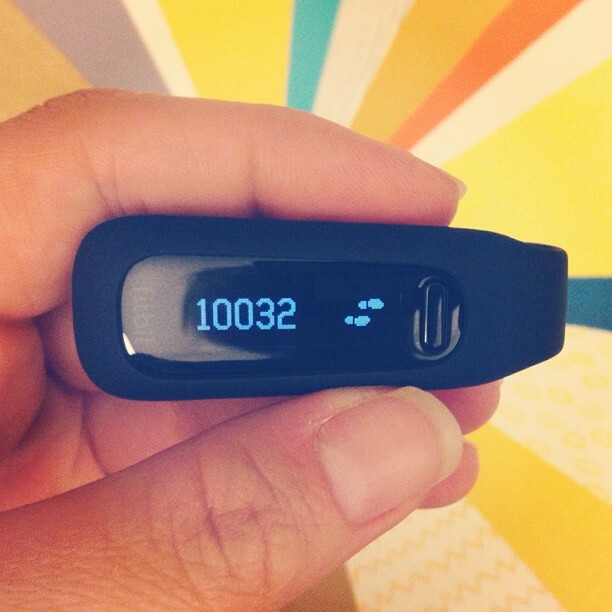 As I’ve said over and over and over again, I always wanted to be able to track 10K steps per day. Since the late 90s I would get a pedometer here or there, always the old school click, click, click type, and they were bad. I would think they worked, but then I’d get home and realize that I had only walked 2K steps the whole day. I was certain that the 10K steps per day idea was only for people who are runners, not the average person, like it’s aimed at. Then Fitbit comes into my life, and lo and behold it tracks actual steps AND while getting 10K steps a day isn’t always easy, it is totally feasible. I don’t know how or why I’ve been able to stick with it for 5 years, but I am so grateful for this tool. That being said, I’m about to get negative with Fitbit because they discontinued my device last year without any announcement, and I’m devastated. I’m not exactly sure why the bracelet type pedometers have really taken off, but they have, and so companies are ready to take in as much money off of the trend as possible. My device, the One, was a clip on, that I wear discretely clipped to the center of my bra. Some people just wear it on a waistband or hold it in their pocket. I just don’t like the idea of having to wear a bracelet all the time and even though reviews show the bracelets to be very accurate against the One. I just don’t understand how my arm movements won’t get tracked as steps. My mom says her steps ARE NOT tracked on a bracelet if she is walking with a shopping cart at the grocery store, so I’m guessing there are plenty of other circumstances that are similar. The One is rechargeable and holds that charge for about 10 days. It can be used to track sleep, and counts flights of stairs. Meanwhile, the clip type fitbit that they kept on the market, the Zip, is half the price of the One. Let me just tell you from experience, DO NOT BUY THE Fitbit ZIP! It only takes batteries, so you have to replace them regularly. It doesn’t automatically sync to your devices either. We bought one for our mom and it was the worst. I think it died and had to be replaced 2 or 3 times before we just decided to upgrade her to the Flex. The zip does not count flights of stairs, and neither does the Flex, so the One was really a great product. People have complained many times online about their discontinuing the One, but they just shut down the threads and refuse to respond other than to say that they have made up their mind. That being said, when I looked up the link for the One, it redirected me to the zip automatically, BUT it looks like they are still selling the One in Europe. I wonder if it was more popular there? I keep hoping that maybe if this bracelet fad kinda dies down a bit they will realize they need to have at least one quality clip pedometer to their brand and the Zip is NOT it. Fitbit has SEVEN different bracelet trackers and only the one clip. What a bummer. Anticipating – Ugh, this is something I need to work on. I just wrapped up a few projects and so now I’m in a slump of “what to do now?” Not that I don’t have anything to do, I have plenty more projects going, but I’m needing a BIG thing to look forward to and excited about. 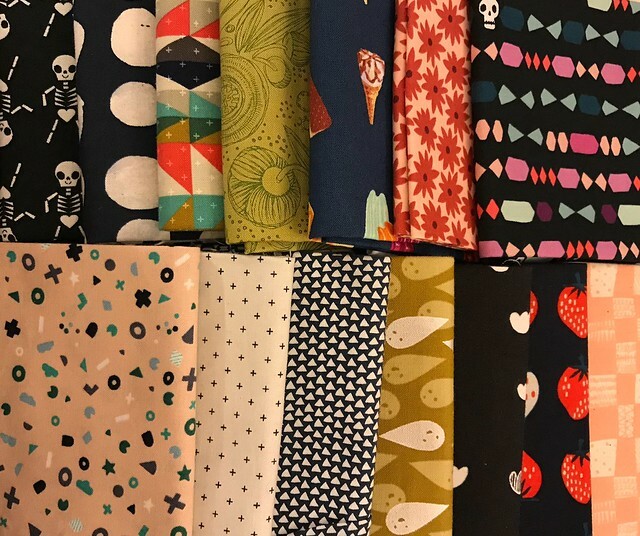 Buying – Some lovely fabrics from a trip my mom and sister and I took to Linda Z’s in Arlington Heights and Stitchworks in Evanston. 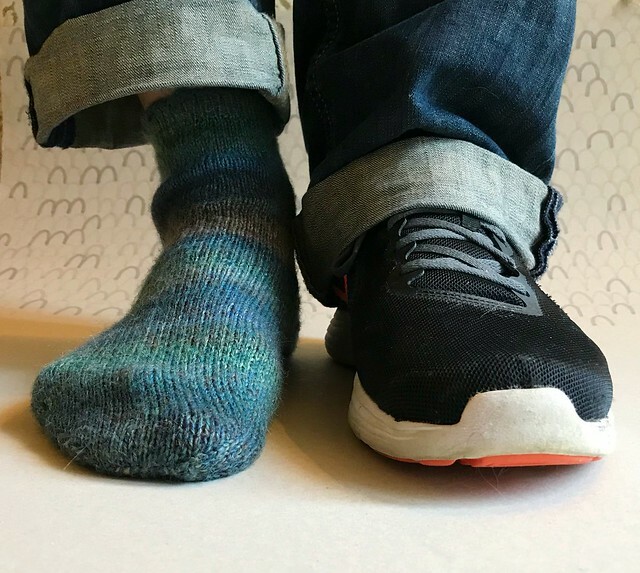 Creating – I knit a SOCK! Just one sock, lol. I remember first attempting to knit a sock back in probably 2002-2003 and got to that heel turn and couldn’t figure it out. I have tried several times since then and just never pushed through. Finally, with the help of my sister, I got it done. Pictured above, Matt modeling the sock I knit. Now onto a whole pair. Eating – My mom, sister and I are doing Seattle Sutton over Lent, and I’m so thankful to them for gifting it to me because it is incredibly expensive. I’ve always said my whole life that I just wish I could get a Jetson’s type pill meal so I could just pop in my full and balanced nutrients, and move on, and not have to worry about food. This is by far the closest I’ve come to that. Feeling – Relieved that I’ve gotten a few big deadlines wrapped up, for work-work and for my personal work. Loving – Our humidifier. Matt’s parents handed us down their old one a year ago and I swear that this thing has transformed me from starting to HATE winter, back to loving it again. It’s all about avoiding the dry air! I think I probably drop a couple gallons of water into the air every single day in our home. Before, I was trying to use a baby’s room mister, but still getting bloody noses and my hands and fingers were so dry they would crack and peel. Missing – The 80s and 90s. I had a very vivid dream a while ago where my mom and I were able to go to a mall that was the 80s. We didn’t go back in time, but somehow found ourselves transported to this time. The fashions! The prices! Even though we were in an 80s mall where you wouldn’t have a shopping cart, I had one and was stuffing my cart full of stuff because I was so excited to be able to bring all this stuff that was straight from the 80s, back to current day. The dream really stuck with me and for weeks I couldn’t stop thinking of things from the 80s and 90s that I missed and wished that I could go back to get a glimpse of again. One thing in particular that I think of all the time anyway is the store chain Arcadia, that I finally found out was probably only in our area as a test market because it was part of Carson Pirie (Scott) which is a Chicago based business. Arcadia was the most amazing stationery/gift shop store. It was my favorite store at malls and I remember dreaming as early as 5th or 6th grade that some day I’d be able to design my own paper products because of it. What I would do, just to see pictures of those stores again, and the products. I remember lines of paper products, one that really stuck out to me and I had a bunch of, was a white matte on white gloss stripe motif. Spiral bound notebooks, folder, pencils, papers, etc. Procrastinating – Sending in my latest Art-o-mat series. It’s complete (I’m embarrassed to admit, 5 years in the making), I have photographed each piece. and now need to package them all up. I also ordered blocks for my next series which I’ll begin, once I have the last series sent off. Reading – I’ve been so busy I haven’t been reading at all, but I need to get back to some books I was enjoying, but put down when my schedule got crazy. Seeing – We went to the movies for the first time in almost a year and saw the new Star Wars movie. Watching – It’s been a long time since I’ve done one of these posts so I’m just gonna list a bunch of things we’ve watched and loved. At Home With Amy Sedaris, Love, Lady Dynamite, The Good Place, Last Man on Earth, Broad City, Difficult People, The Handmaid’s Tale, and Alias Grace. Oh, and always watching whatever true crime docs I can, wherever I can. Wanting –A whole wardrobe that reflects my pinterest fashion board, Oh, and anything else in my regular wishlist, lol. Earlier this year I read this where a person said that before falling asleep they think of the people they like, receiving good news. I think about that occasionally ever since reading it because 1. it is such a sweet and altruistic idea, and makes me so happy. 2. Maybe what we think of in those moments before we sleep can be seen as a snapshot of our inner thoughts and true being. and 3. Now I like to ask people what they think about in the moments before they fall asleep. Matt said he doesn’t think, and I believe it. His head hits he pillow and he’s out (sometimes even before that point). Matt’s Mom said she counts. I almost always like to think of art and making. Creating, art materials, concepts and ideas around art. When I was young I used to have insomnia. When I was in college we were required to keep a daily sketchbook (a page for each studio class each day). I slept with my sketchbook in the bed next to me, and that is probably when I started thinking of art before sleep, and also when I probably stopped lying in bed all night watching the clock of doom tick away. Often, I’d reach over and scribble out ideas or sketches that I had in half (or full) dreams. It’s where I had the idea for my ongoing Circle Series. Actually, at that point, I didn’t have my sketchbook in bed with me, so I rushed into the kitchen and drew this out on my dry erase board on the fridge. I had been wanting to work in a way where I could use a lot of different mediums and styles, and still incorporate them into one cohesive body of work. Earlier this week I had another one of those ideas right as I was falling asleep. 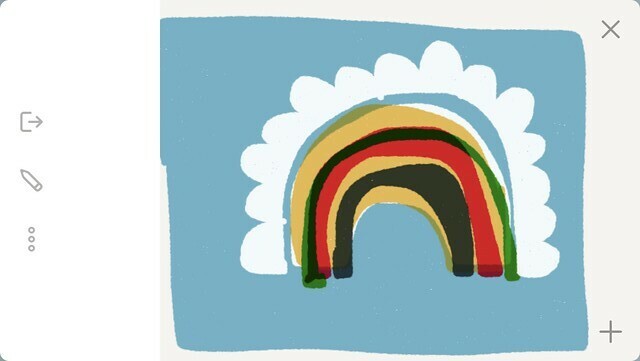 I grabbed my phone this time and used an app to scribble it out. 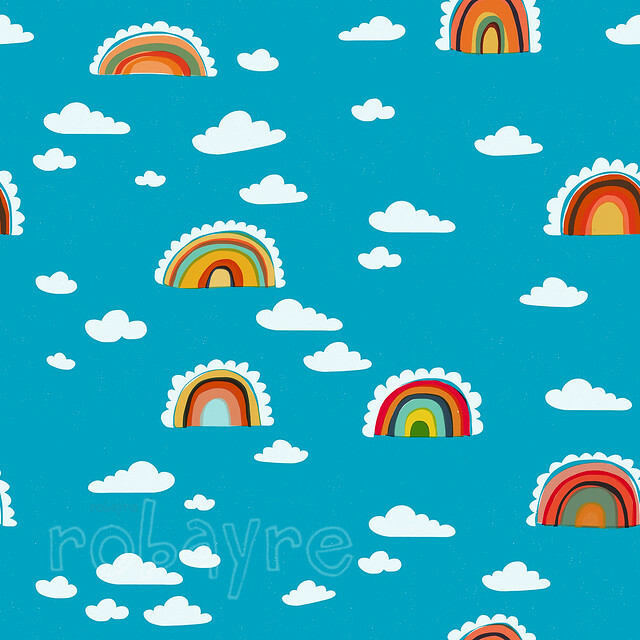 I had the idea of the “Bright” pattern I made (above), but cutting the circle in half, essentially making it into a rainbow shape. 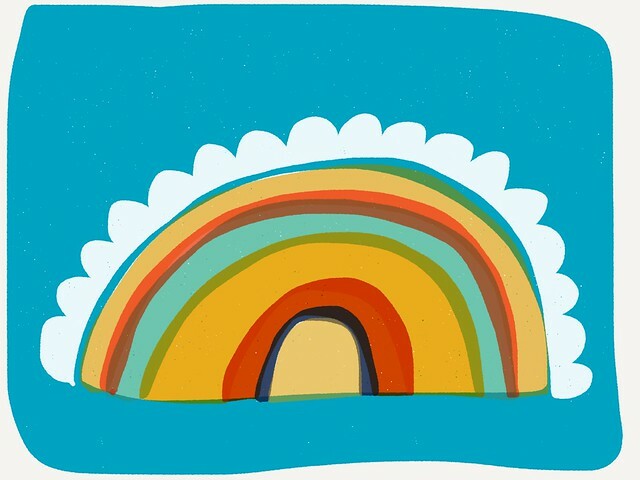 Originally, in my head I think the half circle rainbows would become like a scallop pattern, rainbow next to rainbow, next to rainbow. 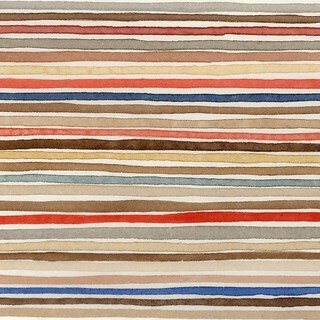 I’ve been thinking that I should try some patterns that are not so tightly fit. A lot of the patterns I make are pretty packed because when I use fabric and sew I know that if things are too spread apart, and fabric is cut small, you don’t get to see much of the pattern. 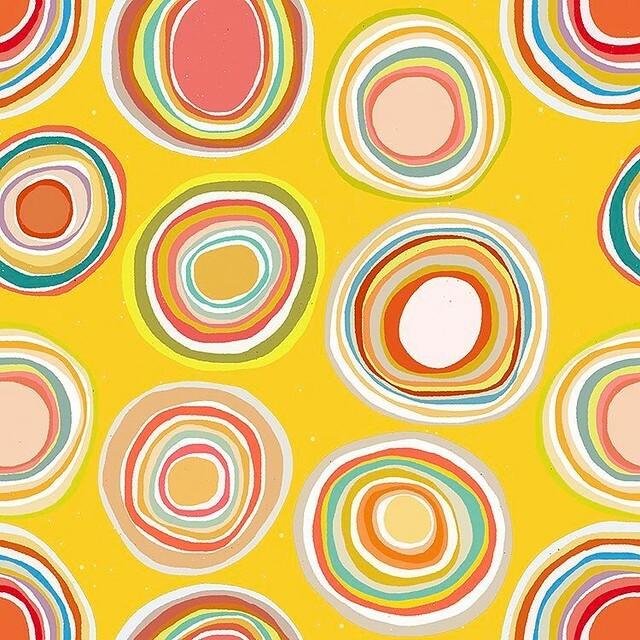 I’ve just long preferred tiny patterns on fabric, ever since my first days of making yoyos as a teenager. When I thought of this new pattern, I thought it might be nice to switch it up. I thought of it more in terms of larger fabric pieces (fashion or upholstery), perhaps because of the influence of Society6 and Spoonflower on me. I also have been working on a different scallop pattern series already, with gelli printed papers, so I decided to really go with a “rainbow” feel. 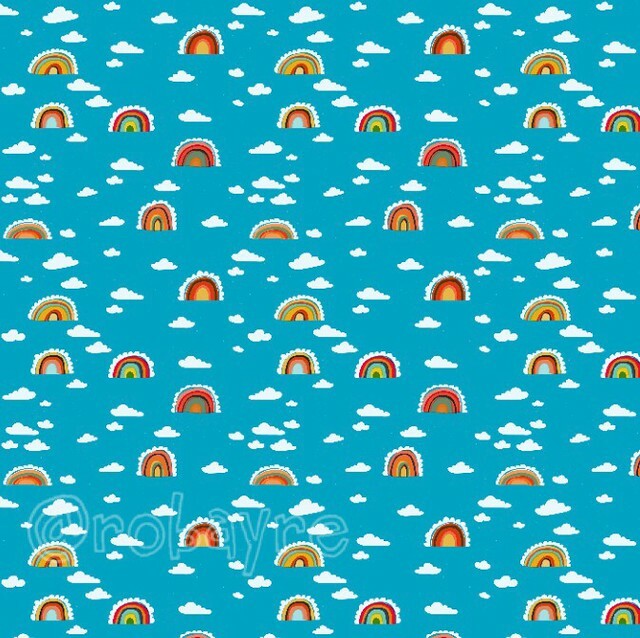 Since the rainbows would be more spread apart, I thought I needed to add another element, so I thought of adding clouds to the background, and that was when I had the idea to add an actual scallop, cloud-like edging, to the outside of each rainbow. 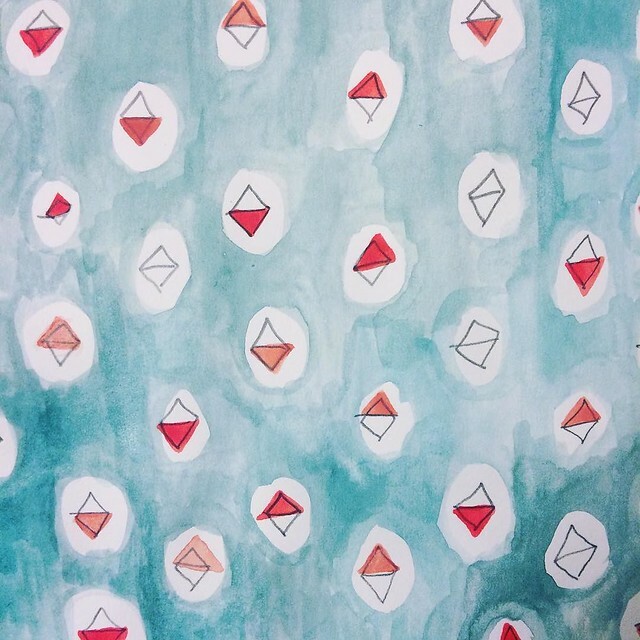 The whole pattern feels kind of dream-like, so it was appropriate that it came to me the way that it did. 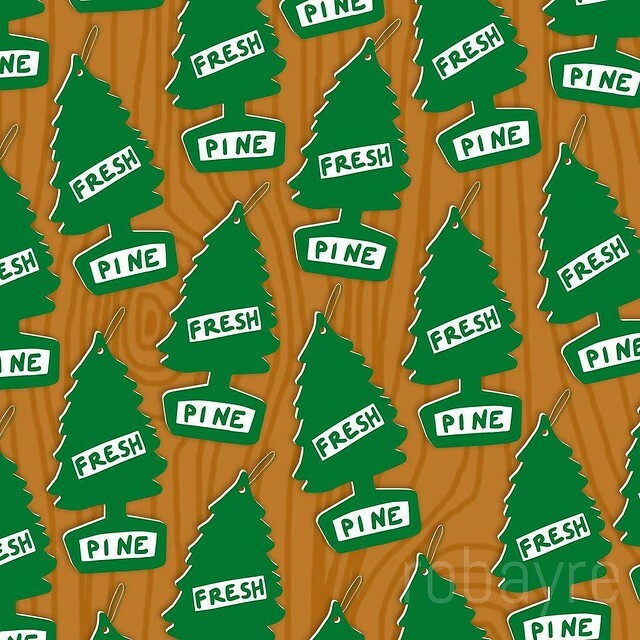 Here is a 3×3 repeat of the pattern, so you can see what it looks like on repeat overall. Last night I had another idea, only, stupidly I thought the idea was concrete enough that I’d remember it in the morning and of course, it’s gone. Word to the wise, dream ideas are never concrete. Maybe it will come back to me again tonight. What do you think of before going to sleep? Going through old emails in my inbox, and I found this note to myself. My inbox is mostly filled with emails to myself for project ideas and things I want to deal with later. It’s not too bad, I have about 30 emails but they literally span years and years. This one was from May 2015. I’m not going through this struggle right now, as I’m actually overflowing with productivity (almost the opposite problem), but this note still seems very important and I’d love to hear how other artists and creatives push on after the initial excitement wanes and subsequent pieces seem less and less AMAZING. 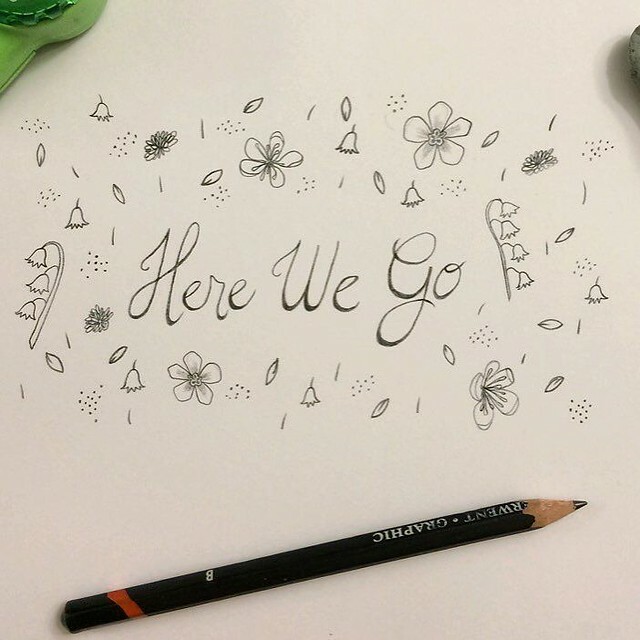 “How does one deal with the stress of expectations and still stay creative and productive? My favorite and most creative work comes from creative exploring. What happens after the first piece or two after I have an idea or concept for a series that I’d love to continue with. What happens when you want to keep producing this thing you’ve started but it is no longer creative exploration, can start to feel repetitive or redundant? Side note: I had to add the song Late Greats by Wilco because there’s something about artists being prolific to become successful that makes me think of this song. Perhaps the greatest piece of artwork hasbeen lost to time forever because the artist only made the one piece. Also, I just needed to post this in hopes of getting the ball rolling again on blogging. I have so many things to share, but feel overwhelmed by it all and where to start, so this is as good of a start as any. I’m doing the 100 day project again this year. Last year during the project I focused on finishing up a lot of already started stationery projects and getting them listed in my shop. Here is a link to 2016’s 100 days. It kept me very productive and I enjoyed being part of the community of other creative and prolific makers, so naturally I’m going to participate again. 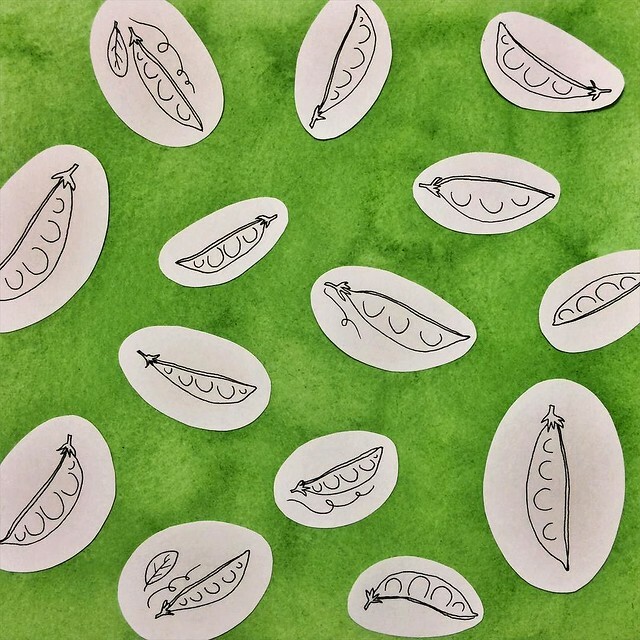 This year for the 100 days project (starting on April 4th, 2017), I am focusing on getting already existing work (especially patterns) up on POD (Print on Demand sites). 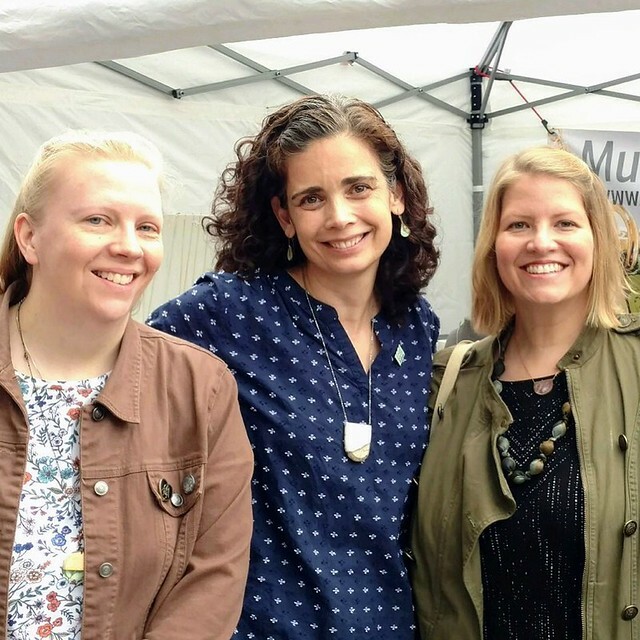 Last year I closely followed and was SO INSPIRED by my friend Julie’s posts about artist’s making passive income. I’ve had a Society6 shop (where I upload images and customers can get art prints, or products with my images printed on them)for years, but it is pretty neglected. 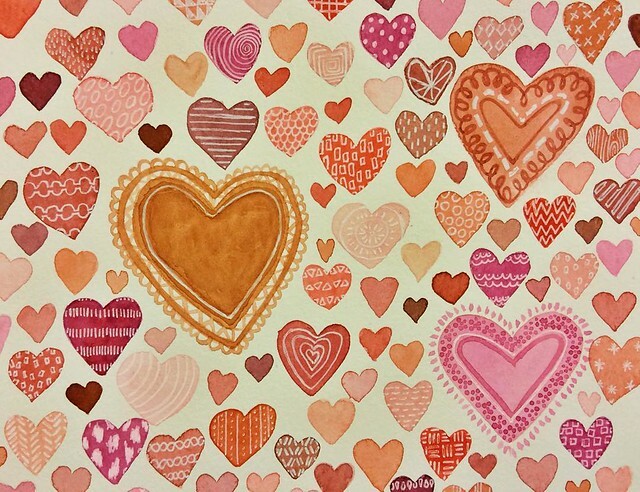 I also want to finally get some of the patterns I designed printed onto fabric using Spoonflower. I’ve had an account with Spoonflower since they first opened up and I had to be put on a waiting list and be invited to join. And then… nothing. I NEVER actually printed anything. Fast forward to present day and I am using the 100 Day Project to remedy this quandary. I have 2 kind of selfish goals 1. to get a cell phone case of my own artwork for my own phone and 2. order fabric of my own artwork to sew a bunch of things. On the first day I posted this over on Instagram: I’m laying down some groundwork to help me stick it out. 1. My main focus will be to get my work ready and up on POD sites. 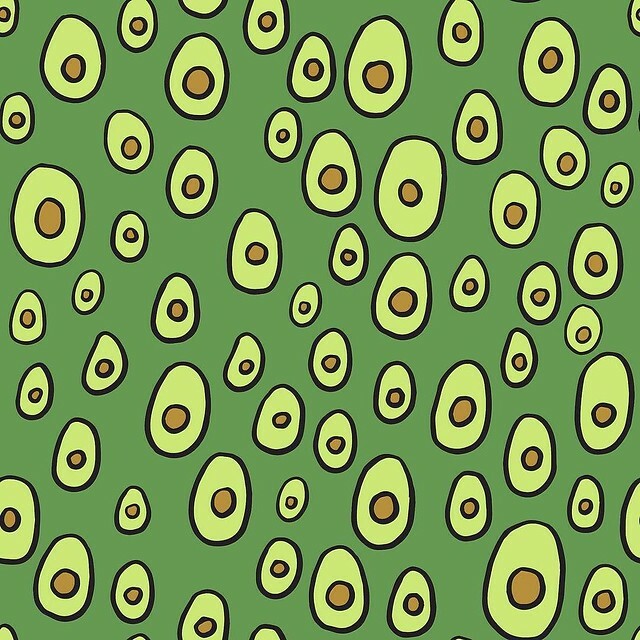 I’ve had a society6 shop for years but have not kept it up at all, and I want to finally get a lot of my favorite patterns up on spoonflower, and explore other options as well. 2. If it takes longer than 100 days, so be it 3. If I want to switch up focus on things for a while, so be it. 4. If I only work on something for 15 minutes a day, so be it. 5. Most importantly I want to work on something creative and productive each day. 6. I’m gonna stick with my general #robayre100days hashtag. Here we go! 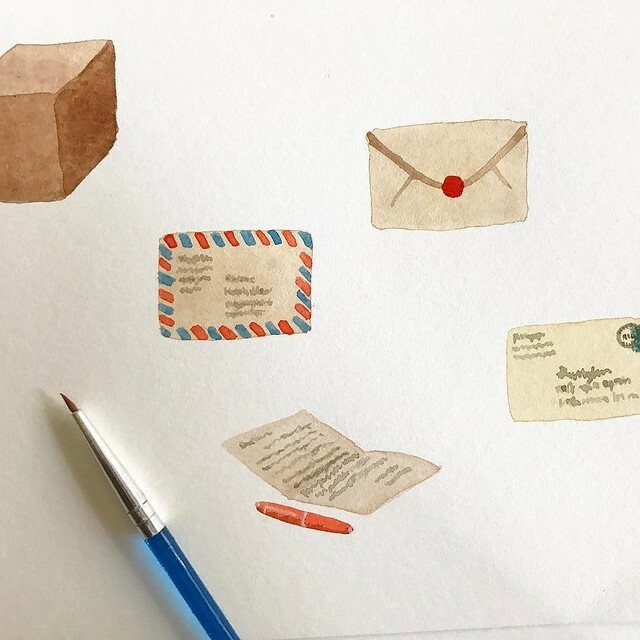 I immediately dove in and worked on this vintage mail pattern. Cleaning it up, making it a repeatable pattern, etc. 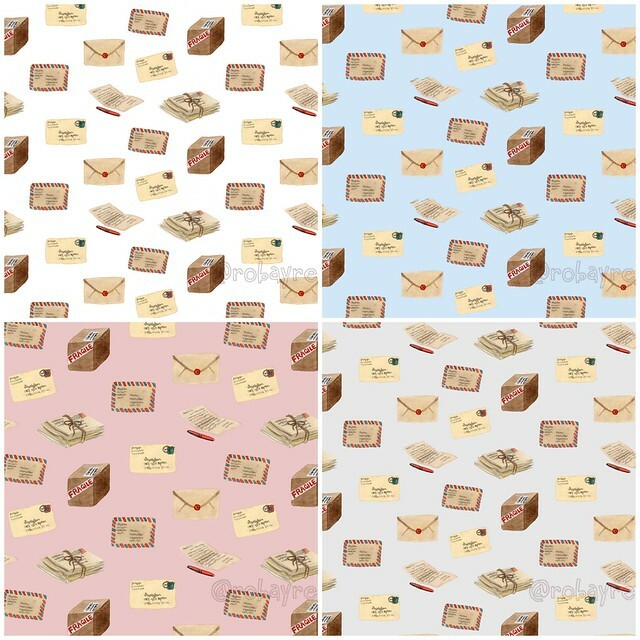 I made it with 4 different backgrounds, pink, blue, gray and white and uploaded it to Spoonflower. While I had it so close, I figured I might as well set it up as a digital (printable) pdf stationery set and painted a striped watercolor piece in the style of many of my other stationery sets, and uploaded it to etsy. 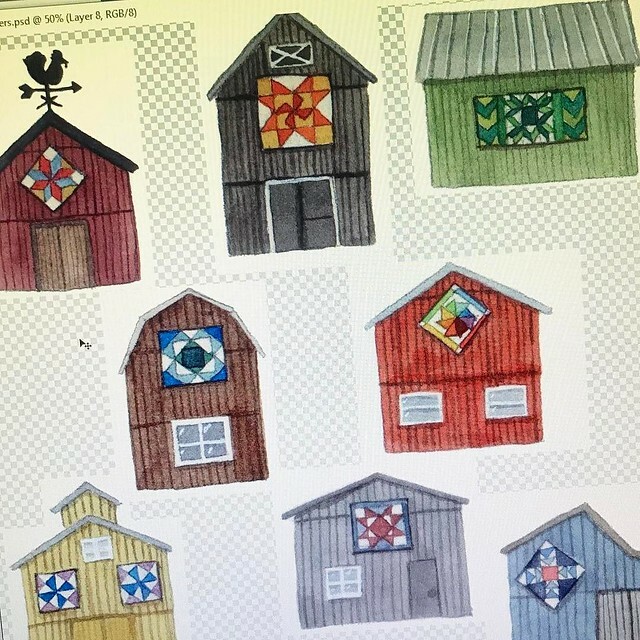 Next I wanted to work on my barn quilts pattern but before I got too far I realized I should have taken the vintage mail pattern and uploaded it to Society6. That opened a whole new can of worms because it had been so long since I had really dealt with Society6, that I had some learning curves. One thing that was GREAT to discover, was that if you upload original art files that are HUGE, it will enable other products immediately. Before, I had to customize each image to fit very specific dimensions for a mug vs. a cell phone case. Now, I can just re-position things on their website. 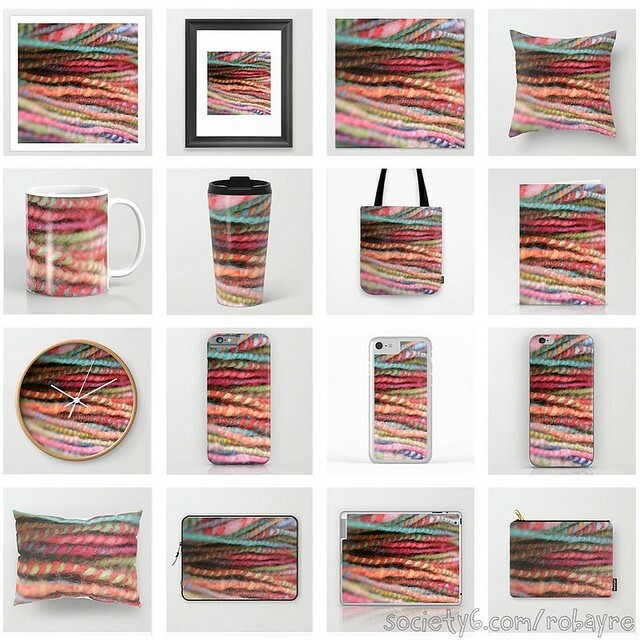 Another thing that is pretty great is that since I first opened my society6 shop, they have gone from offering art prints, mugs and cell phone cases, to a huge variety of additional products like towels, rugs, shower curtains, zipper pouches and more. For the next several days I just worked on adjusting the existing 24 patterns I already offered and enabling more products on those, like this handspun yarn, which was the very first pattern I uploaded there and my most popular product so far. 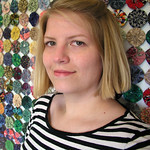 I’ve uploaded a few more patterns now and am still doing research. One thing that was shared with me, and was very insightful was a Free Skillshare class on passive income, by top Society6 seller CatCoq, (you just have to create an account and log in to watch). Incidentally, Cat was also interviewed by Julie (mentioned above) in her passive income artist’s interview series. So, that’s where I am now with my 100 Day Project. And if that wasn’t enough, I also committed to participating in the #30Letters30Days project as well. AND! 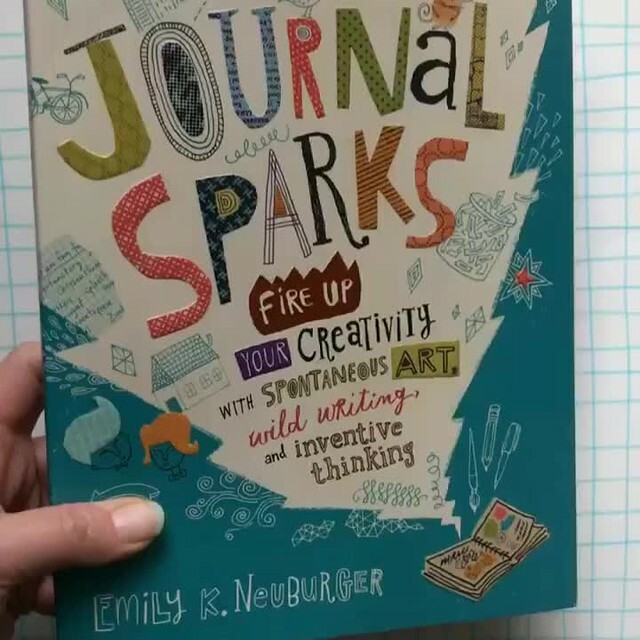 Tomorrow (Thursday, the 20th) I am participating in a virtual book tour for Emily Neuburger‘s new book “Journal Sparks“. Check back here, and/or instagram and facebook for a peek into a project from the book and a chance to win your own copy. I’m over a third of the way through #the100dayproject. Some days I feel overwhelmed and question why I committed to this project, but more often I’m glad that I did and have been super productive. 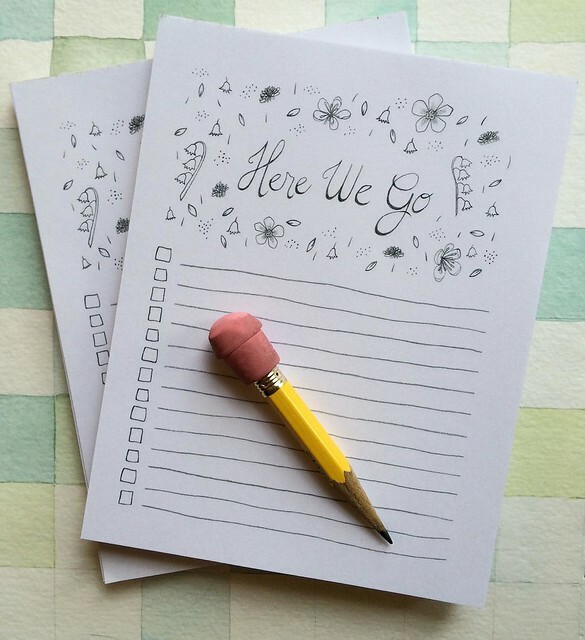 My goal was to focus on paper products, and aiming to add 10-15 new products to my shop. I said 10-15 new items because I’ve been trying to get my shop back up to having at least 100 items in it. Since the project began I’ve added 14 (I think) new items to my shop already, that being said, several of those are one-of-a-kind, original items, and I’ve already sold 6 one of a kind items in my shop. Counting all ups and downs, I’m up to 90 items in my shop. Being this far through the project, I thought I’m overdue to sharing some of these projects. I drew it on the very first day to kick off the project. And turned it into this stationery. 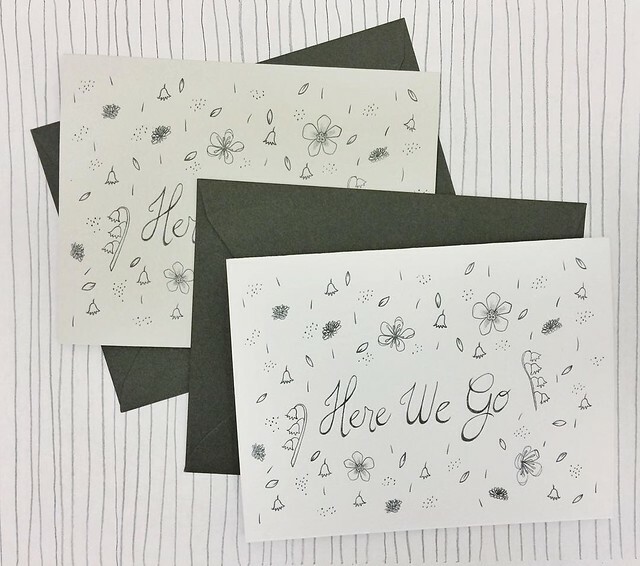 I used charcoal envelopes, and instead of ruled lines, scribbly ones that make me so happy. 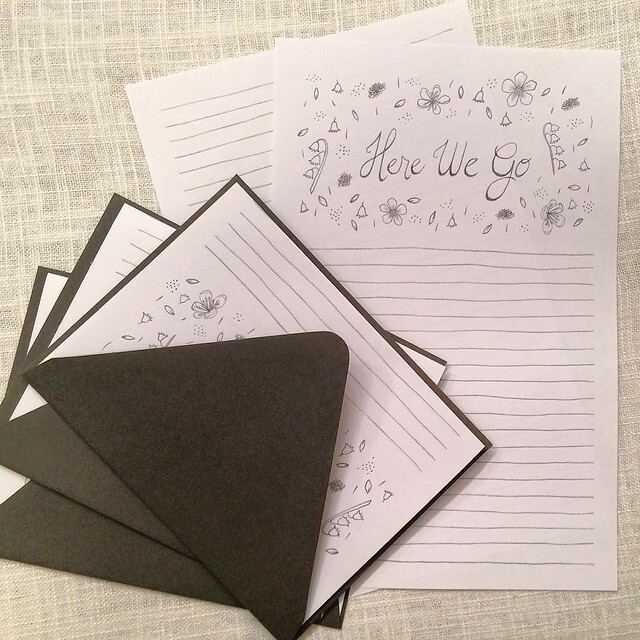 I also made it into a notepad, because the phrase Here We Go seemed to lend itself well to a checklist, perfect for getting things done, or packing for a trip, etc. And lastly, and unexpectedly, I had a custom request to make it into a graduation card. I printed it on a light gray paper and did a bit of rearranging of the image. 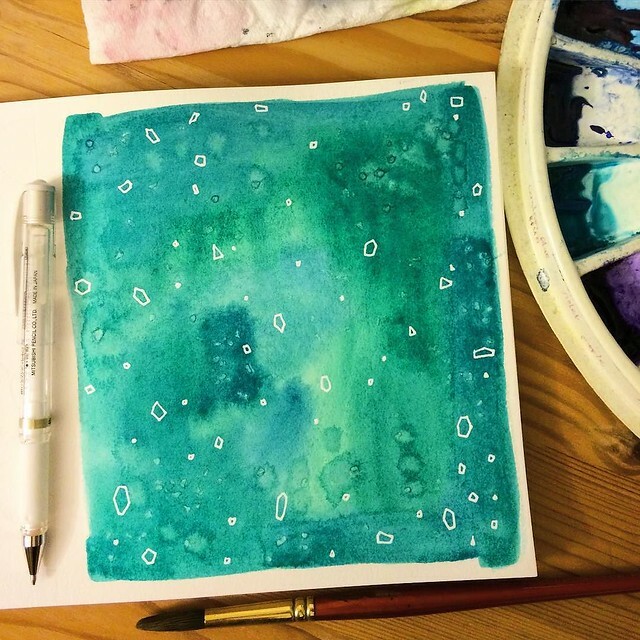 Anika tagged me in a post for the #100daysproject and I really want to do it. I’ve wanted to do it in the past and have enjoyed watching other people tackle the project. My only question now is what to do for my project. I keep having different ideas, do this, do that, just make sure to do something (anything) everyday and share it, no wait, I need to focus my energy in one direction, but wait, I don’t want to be stuck doing the same thing for 100 days. Blergh. It starts on the 19th, so I still have a day to stew on it. In the meantime I should wrap up sharing the rest of my #patternswithanika from february and march. I am one of those freaks of nature that isn’t obsessed with chocolate. BUT, I do LOVE candy! 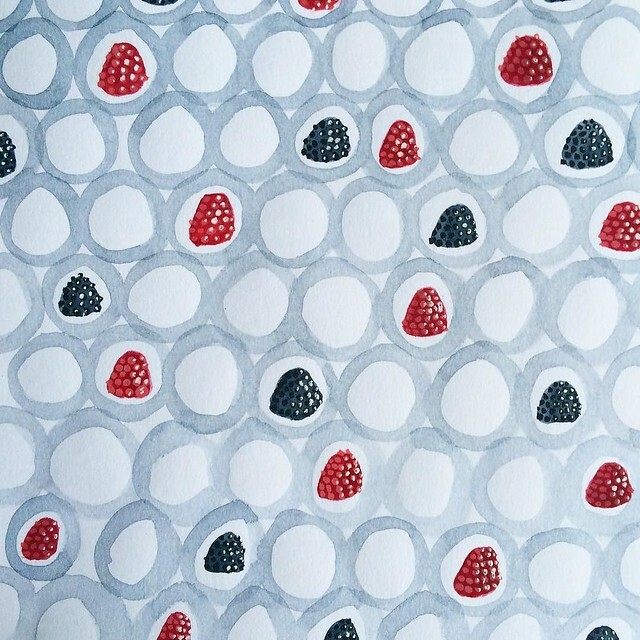 So when I saw chocolate I thought I’d do a pattern with a lot of different kinds of candy, but my mind just kept only going to those gummy raspberry candies with the hard little balls on the outside. They are one of my favorites. I decided to stop fighting it and just go with that. I turned to the computer to do this. I think I sketched it in my sketchbook and then scanned it and worked on it in illustrator and photoshop. Back to my sketchbook. This was a combination of watercolor and pen and ink illustrations. Watercolor and gel pen in my sketchbook. That is all for now. Stay tuned for the 100 days project. And if you are participating too, let me know in the comments. I’d love to hear about your project. And if you haven’t heard about it before, check it out here and feel free to join in on the fun. It’s been silent over here on ye old blog for far too long. Some time in February we had crazy winds which caused day long power outages all over the county. We only suffered from weird brown outs, where somethings turned off (like the oven and humidifier), somethings stayed on (like the TV), somethings dimmed (like the lights), and somethings just DIED FOREVER (like my computer). Honestly, I’d been complaining about my ancient computer (10+ years old) for quite a while, but Matt kept assuring me “It’s fine”. Well, it wasn’t, and I was quite annoyed. Note, I was annoyed and not hysterical because I had fortunately backed up my computer not too long beforehand. He tried to resurrect my computer with no luck. I looked around for a thrifty alternative; even the cheapest computer I could find has to be better than a 10+ year old monster, right? Fortunately, Matt’s mom heard about my plight and had been wanting to get a new computer and offered us her old one. Apparently, her old one is better than what I would have purchased brand new (faster and larger) and so now I’m back in business. High Five! I feel like I have a mile long to-do list of things I wanted to get done on my computer. 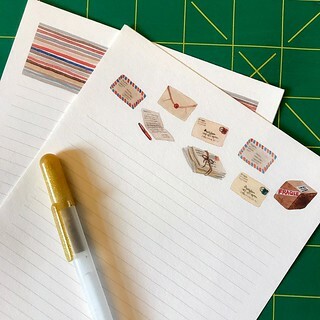 I have a list of new paper products that I want to make, I need to print more of my nephew’s stationery that I designed for him for Christmas, and I want to blog about a bobajillion things. I have recovered or redownloaded any of the design and photo editing programs I use. I’m in limbo with anything I want to scan because my scanner apparently is no longer supported on Window 10. womp, womp. Anyway, Here I am, breaking the ice after a long time. I thought I would share my seasonal chalkboard calendar, as I need to erase it and start it all over for Spring. SPRING! Anticipating– My best friend’s wedding next month. I’m nervous and stressed just thinking about it, and it’s not even my wedding. Creating – Oh, my gosh! I’m working on so many projects, it’s great! Most recently I’ve been inspired by the artwork of Xochi Solis, and playing around with a new line of envelopes for a potential stationery set. The envelopes aren’t like her work, but listening to the Art for Your Ears podcast with her, and looking at her work lit a fire, and the idea just popped into my head. Eating – HEALTHFULLY! I know one thing and that is eating unhealthily (overeating, processed, and take out foods) leaves with you even less energy to prepare meals and eat well, and I was caught in a bad downward spiral. This year my sister gifted me one of the best gifts ever – She paid for my mom, my sister and herself to do a 5 week run of Seattle Sutton. It is not cheap, folks. But now that we’ve been eating better and have learned quite a few lessons, we are taking our newfound energy and momentum and continuing with it. And I’m so happy, and so grateful. Thank you, thank you, Chris! Feeling – Lighter, happier, more energetic and inspired! I always walk (fitbitting with 10k steps daily now for 2.5+ years) but lately, I’m incorporating more actual workouts and it feels great. Listening – Podcasts! Podcasts! Podcasts! I’ve been talking forever about sharing a post where I list my favorite podcasts, and I promise, Courtney, I haven’t forgotten. Loving – Walking. I was going to say “The warmer weather so I can go out walking” but in reality, this winter, I really never stopped going for walks outside. When I was young I would go and stay with my grandma and she went for walks every day. I remember feeling like it was a chore and her having to persuade me sometimes, but instead of it being this “workout” she made it more of a whole experience; getting fresh air, listening to and trying to spot birds, observing all parts of nature, collecting cool rocks and leaves, etc. Later, I always wished that someday I would do that as well, that I would go for daily walks, and now I am so happy to realize that vision is finally true! Procrastinating – This category is giving me serious guilt. I have a bunch of things I need to do and haven’t. The kind of guilt that stressed me out of deep sleep this morning. Did I take care of any of those things today? No, of course not #failure. OK, wait, before I’m too hard on myself, I have also been really productive and crossing lots of things off my to-do list. Reading – Um, this is causing me guilt too! I have a pile of books on my bedside table, some overdue books even. Let’s not talk about the backlog of magazines I subscribe to and have been carrying around with me, but never reading. Seeing – The grass starting to turn green and grow. Normally this might be exciting to me, but the trees are all still absolutely naked and yet, I think we are going to have to mow soon. Gah! Watching – We are watching the last season of Community with our “movie group”, which originally aired on yahoo. We’ve watched all seasons up to this. SIX SEASONS AND A MOVIE, Whoop Whoop! Did you ever watch this show? If not, I highly recommend starting from the beginning. Also, we watched the Good Dinosaur the other day, meh. 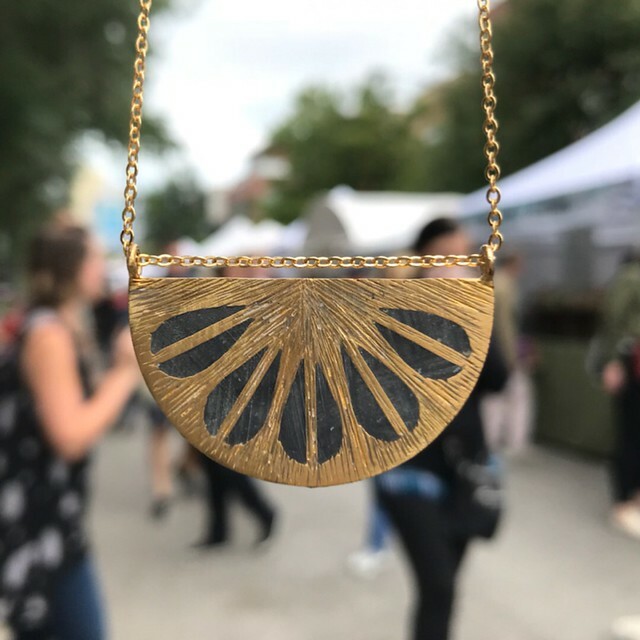 Wanting – I recently started a wishlist on pinterest and I’m trying to remember to put things there, rather than just spending thoughtlessly, or forgetting what it was that I really wanted.